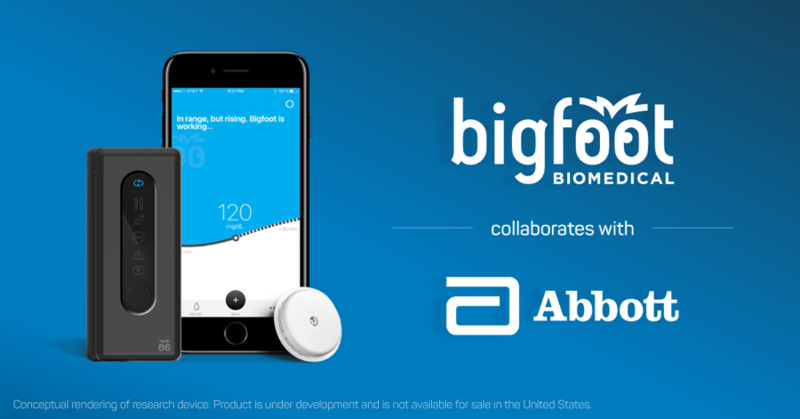 Diabetes technology companies Abbott and Bigfoot Biomedical just jointly announced a new partnership to automate insulin delivery for both pumpers and people on injections. Bigfoot’s systems will now use a next-generation FreeStyle Libre glucose monitoring sensor. Like the one that is now approved in 37 countries (not in the US), the “next-gen” real-time glucose sensor will not require fingerstick calibration from a blood glucose meter, easing a burden posed by current continuous glucose monitoring (CGM) devices. In addition, the “next-gen” FreeStyle Libre will add the ability to transmit glucose data continuously to Bigfoot’s pump and/or app (perhaps via Bluetooth), meaning it will work just like a traditional CGM. A major US trial of Bigfoot’s pump-based automated system and “next-gen” Libre sensor is now expected in 2018, a delay of about one-year from the previous plan to start the trial later this year. The companies will need time to integrate the “next-gen” FreeStyle Libre into Bigfoot’s platform, and we’d guess 2019 is the absolute earliest timeframe a Bigfoot system might launch. As pictured, Bigfoot’s approach to automating basal insulin delivery uses a pump without a screen, an embedded closed loop algorithm to control insulin delivery (mealtime boluses still required), and a very user-friendly app to interact with the system (read more here). The “next-gen” FreeStyle Libre will still be fully disposable and retain the same slim on-body appearance as the current FreeStyle Libre sensor (see our Test Drive of the current version here). It’s not clear if the next-gen Libre sensor will still last for 14 days – we’re assuming so but that’s a guess on our end. For those on multiple daily injections (MDI), the partnership is also pairing the “next-gen” Libre sensor with Bigfoot’s “auto-titration system” to provide users with smart dosing advice based on previous glucose trends and insulin information “captured” from a Bluetooth-enabled insulin pen cap. Bigfoot acquired Timesulin, one of these “smart” pen caps, in June. The timing on this product still needs to be discussed with the FDA; however, it will leverage a lot of the learning from the pump-based system to “close the loop” for those on injections (e.g., telling users how much basal and bolus insulin to inject based on patterns). It is very exciting to see Bigfoot and Abbott developing systems for both delivery methods – insulin use is still sub-optimal for so many and there’s a big opportunity here to improve safety and create less work for both people with diabetes and their healthcare providers. As part of this deal, Bigfoot has committed to use only Abbott’s FreeStyle Libre sensor in the US (an “exclusive” deal). This means previous R&D partner Dexcom’s CGM will not be used in the Bigfoot system going forward in the US. So far nothing has been shared about Bigfoot’s plans elsewhere in the world. Notably, the “consumer” version of Abbott’s FreeStyle Libre “flash” system has yet to receive US FDA approval, although it is approved in 37 other countries including, most recently, Canada and Mexico. Abbott has not commented recently on when FreeStyle Libre might be approved in the US. The “flash” version of FreeStyle Libre also does not require fingersticks. Unlike the “next-gen” version, however, it does not have continuous communication or alarms. Instead, the user must “scan” the sensor with a “reader” to get a real-time glucose value and trend arrow (read more here). The related “Pro” version of FreeStyle Libre, a retrospective 14-day sensor applied by a healthcare provider, was approved in the US last fall (read more here). Bigfoot’s system, now including the “next-gen” Libre sensor with continuous communication, will be separately filed with the US FDA. It’s unclear if Abbott will also launch a next-gen version of FreeStyle Libre as a standalone CGM, similar to the Dexcom G5. Assuming it secures approval, Bigfoot will likely have the first automated insulin delivery system driven by a real-time glucose sensor that does not require fingersticks, as well as the first system that leverages a smartphone app for the primary user experience (e.g., meals and boluses are entered in the app instead of on the pump). These two advantages make Bigfoot’s system more ambitious than others in development – see our 2016 progress update on closed loop here for more. What does pricing look like? Bigfoot plans to bundle all parts of its system (pump or smart pen cap, FreeStyle Libre sensors, ongoing supplies, smartphone app) into a monthly service offered through a single prescription and single copay – for everything but insulin! Insurance providers will be charged a fixed monthly rate – a big change from the current model of an insulin pump that lasts four years and has an upfront price of several thousand dollars. Increasing cost predictability and decreasing the hassle of multiple prescriptions and copays will be much appreciated. Bigfoot also plans to have over-the-air software updates, meaning its systems will be able to be updated similar to smartphone apps. We salute companies bringing transformative technologies to people with diabetes. There is such potential for many already on insulin to benefit from more informed dosing and for those not on insulin to feel more confident about trying insulin with better tools like this. Bigfoot Biomedical Reveals Its Automated Insulin Delivery System! What’s Making a Splash In Diabetes Technology This Summer?